Hearty stews using root vegetables can be nourishing to the body and spirit as we work our way through the chilly days. In Traditional Chinese Medicine (TCM), Fall is the season of the lungs and large intestines. If these are weak areas for you, this time of year can be a challenge. Sweet roots and dark green veggies like spinach are nourishing and seasonally appropriate, so dig out those cookbooks or search the internet for recipes like curried sweet potato soup or pumpkin or butternut squash recipes. This is a great time to add some spices to your teas and soups! Think Cinnamon in your coffee or tea, Ginger sauteed up with your veggies, and add Turmeric to your soups, stews, and sauces. Turmeric is a warming herb, and just one of its many benefits is that it's a systemic anti-inflammatory, making it useful for inflammation anywhere in the body, like arthritis, sciatica, and even seasonal allergies. Be sure to mix in some black pepper with it, as it makes the Turmeric more easily absorbed by the body. Adding Maitake mushrooms (also known as "hen of the woods"), Astragalus and Garlic to your soups and stews can help the immune system during the fall and winter, being useful for seasonal allergies, as well as viruses. Eating Blueberries daily (about 1-2 oz. a day) may help with allergies, as they reduce the histamine production. It's usually best to start eating them daily about 4-6 weeks before seasonal allergies hit, but if you like blueberries, adding them to your diet now may have some benefit. Blueberries are also good for the small veins and capillaries, especially in the eyes, as well as spider veins. Blueberries also have similar anti-adhesion effects in the bladder as cranberry, so if you suffer from urinary tract infections, they are a good ally to help keep that bacteria from hanging around. It can also be useful for staving off Helicobactor pylori, one cause of gastric ulcers. See below for some simple suggestions to help you handle the cold season. And, every home should not be without an Aloe Vera plant (easy to grow!) and Lavender essential oil (not fragrance oil). This is the best combination for burns of any type, all year round, as well as topical use for cuts, scrapes, and more. Lavender essential oil and aloe vera gel in a bottle (it should be clear to whitish in color) can be purchased locally from Newark Natural Foods, Harvest Market, and Whole Foods. You can also check out my Links page for a list of my favorite essential oil suppliers. Here's to a healthy and gentle cold-weather season! Boil about 2 cups of water (or enough to fill your bowl about ½ way). Add 1-2 tsp. of chosen herbs or 1 drop of essential oil to the heat-safe bowl and place bowl on a table (on a potholder) safely where you can sit with your head over it. Pour water into bowl over the herbs. To Use: Please be careful. Sit comfortably with your head over the bowl and place the towel over your head and bowl, creating a tent. Bowl will be hot! Stay there until there’s no more steam. This can help clear congestion, and lavender (if used) has a relaxing effect on the body. Pour 8oz. hot water over 1 tsp. dried sage or rosemary or thyme. Steep covered 10 minutes. Strain, then gargle with the tea. (What I mean by gargle: take a sip of tea and gargle it at the back of your throat for as long as you can, then spit it out. Do this 2-4 times. This gets those lovely anti-inflammatory and microbe-fighting herbs right to your throat. You can put away the remainder of the tea in the refrigerator and warm a little at a time to gargle later in the day). Also, try dipping a clean washcloth in a bowl of tepid water with 2-3 drops of lavender essential oil in it and gently wipe on the head, face, neck and arms. It feels soooo soothing and the scent of the lavender is calming to the nervous system. (You could also try cooled lavender tea instead of essential oil if you don't have it). Note: if you don't have apple cider vinegar and corn meal, you can use the onion alone. Chop onion roughly. Add oil to frying pan and cook onions lightly, just a few minutes. Add apple cider vinegar and mix, and then add enough corn meal to make a medium paste. Simmer another minute to heat corn meal. Lay out the towel/cheesecloth onto a large plate. Place onion mix into the center, and then fold the towel around it, like a burrito. To Use: allow poultice to cool enough so that it won’t burn the skin. Find a comfortable place to lie down, and apply the poultice to the chest area. Cover with a towel and wrap up in some blankets. Keep poultice on for 20 minutes. Breathe in the fumes which can help thin the mucus, clear the sinus and bronchial passages, and may help relieve the pressure of an earache. 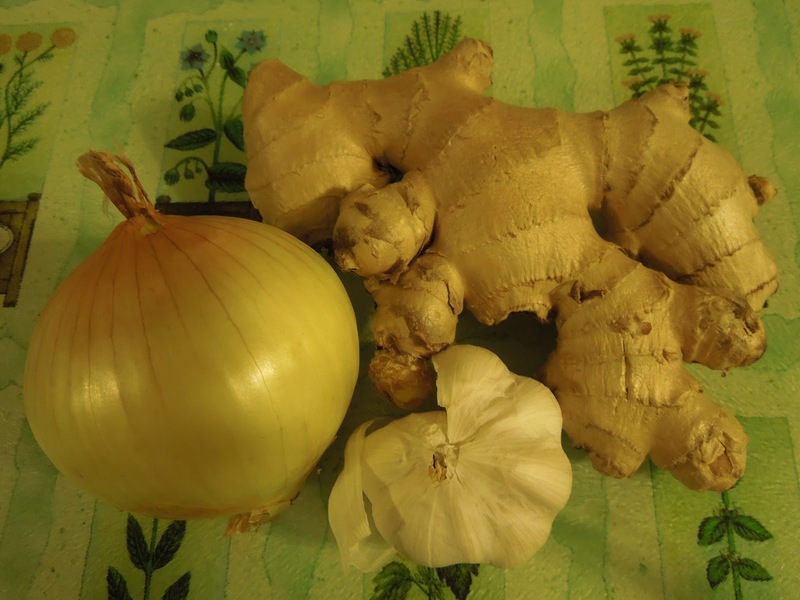 Ginger: This warming spice is a true cold-weather ally. The fresh root is useful for nausea, vomiting, colds and flu with stomach upset, and intestinal viruses. The hot tea will make you sweat and help break a fever. The dried root enhances peripheral circulation and is a great anti-inflammatory for arthritis and muscle pain that feels worse in cold, damp weather. It also inhibits Helicobactor pylori, a bacteria commonly associated with gastric ulcers, and it can help lower triglyceride and cholesterol levels. Garlic: Make friends with this pungent root! It is strongly anti-bacterial and a boon for lung congestion - bronchitis, colds, and flu. Eat 1-2 raw garlic cloves a few times a day when you have one of these serious infections to help clear it up. If you can't take the strong taste, chop it up in some olive oil with other herbs like rosemary, thyme, and oregano, and dip some bread in it for a tasty medicinal treat. Garlic honey makes an effective expectorant and cough syrup. Garlic also helps mildly lower blood pressure and cholesterol and is a mild blood-thinner, so check with your doctor if you're on blood-thinning medication or within a week of surgery before you consume large quantities. Onion: This relative of garlic can help clear nasal congestion (think of that odor!) and help to sweat out a cold. Onions simmered in honey make a sweet and tasty cough syrup to soothe a sore throat. Elder Flowers: Traditional remedy for lowering children's fevers. Mixes well with peppermint for a yummy tea! Slippery Elm: Slippery elm lozenges can be found at your local health food store or co-op. This slippery herb coats the throat and can help that dry, irritative cough with a swollen sore throat. It's also soothing to the gastrointestinal tract and the powder can be made into a nourishing porridge for convalescent people who have a hard time keeping food down. Lemon Balm: This bright plant has a lemony flavor and makes a wonderful beverage tea. It's a great kid's remedy for colds, flu, headaches, gas, nausea, chicken pox, and has anti-viral properties (taken internally as a tea and can be used externally on cold sores). It's also a mood elevator, calming to the nervous system, and can be beneficial for Seasonal Affect Disorder. What's not to LOVE about this one? This is an easy plant to grow (Melissa officinalis), and I highly recommend having this beauty around. She will cheer you up all winter long every time you walk by! Disclaimer: The information contained on this website has not been evaluated by the FDA. This website and its contents are intended as an informational guide and are for educational purposes only. The information contained on this website is in no way intended to nor is implied to prevent, diagnose, treat or cure any illness and should not be used as a substitute for the advice and/or treatment of a qualified health professional. Always seek the advice of a qualified health professional for any medical or health-related issues. The use of any information contained on this website is at the sole risk of the individual. In the event that you use any of the information contained on this website for any reason, the authors assume no personal or legal liability for your actions.